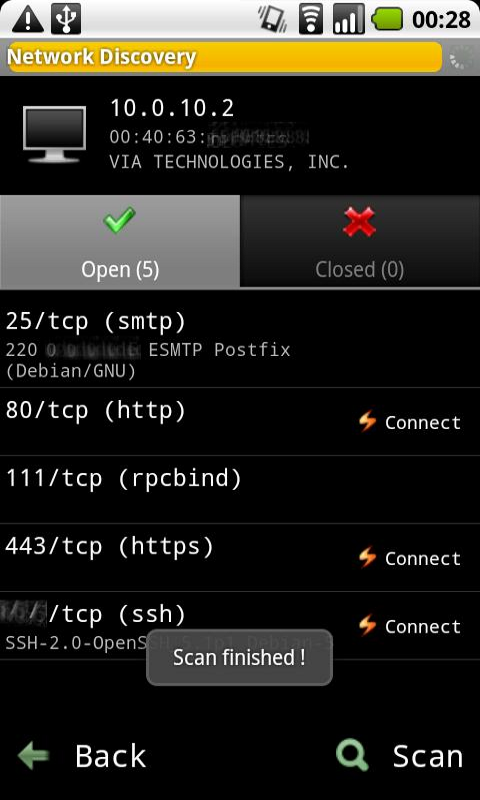 Android network tool: Discover hosts and scan their ports in your Wifi network. A great tool for testing your network security. Root features: SYN port scan, and other improvements or additions. But first I really want the non-root version to be complete. VPN support (OpenVPN, IPSEC) with choice of the interface in Prefs/General/Network Interface. ARP requests are blocked with OpenVPN so you won't have MAC addresses information. Source code available for both root(under developement) and non-root version! Please do not scan networks without the autorization of the owner, the best approach is to get permission first. It may be illegal in your country , so please act responsively. In example, port scanning tools could be considered forbidden in: England, France and Germany, without legitimate motive.